Given the mental health crisis in the US, it seems to me that any and all avenues that can alleviate people’s problems should be acted upon. Right now. A study done at Michigan State University asked patients with depression about physical exercise. A whopping 85% said they wanted to exercise more, and nearly that many said they believed exercise improved their moods much of the time. About half were at least interested in a one time discussion with many wanting ongoing advice about physical activity from their mental health provider. The hitch is that most psychiatrists and other mental health practitioners don’t have expertise in exercise. They may mention it, but they don’t help the client set up a program or keep after them to be active. Marcia Valenstein, senior author and professor emeritus in psychiatry at U-M, suggests mental health clinics partner with personal trainers or community recreational facilities. She says once the effectiveness was established, maybe insurers would get on board. But why wait? Surely even individual counselors and therapists can find a trainer or nearby YMCA to work with clients without charging prohibitive fees. How much is it costing society NOT to do this? Running and juicing and cursing. Oh my. It is so difficult to know what to believe, isn’t it? Will that wrinkle cream really make my neck look better? Is this piece of exercise equipment being touted on QVC effective? Should I go low carb or low fat? I try to find reviews written by real people before I invest in a product or try the latest diet. A book compiling all kinds of advice should be just the ticket. 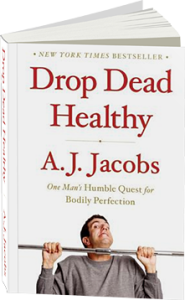 I am really glad, however, that I am not married to A. J. Jacobs, the author of Drop Dead Healthy. Just reading everything he did was exhausting. Seeing it in person (and participating every now and then like his wife did) would have pushed me over the edge. After an unexpected bout with pneumonia, Jacobs sets off on a two-year quest to become healthier. And when he says healthier, he doesn’t mean improving just the usual suspects, diet and exercise. He means head to toe. Jacobs studies research and visits expert after expert on body part after body part. His book has 27 chapters ranging from the health of the heart, lungs, and brain to the hands, feet, and endocrine system. The theories and practices he discovers are fascinating and funny. And the techniques he adopts are effective. He loses weight, gains muscle, and improves his cholesterol along the way. After a favorite aunt who has followed all the “rules” succumbs to cancer, Jacobs has a moment of questioning if any of what he has learned and put into practice is worth it after all. He concludes it is. 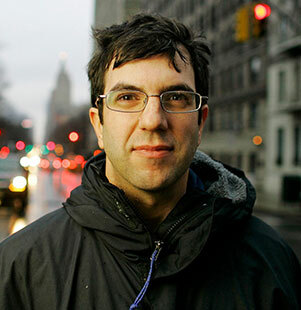 In seven appendices, he synthesizes the best of the advice. Most of the tips are ones we’ve all heard many times: eat vegetables, park farther from the store, meditate. The most unusual tip is to use a treadmill desk. Jacobs says not to buy an expensive model but instead rig one up yourself using a board and some books. That’s a tip worth considering. What products or techniques have you tried that actually worked?